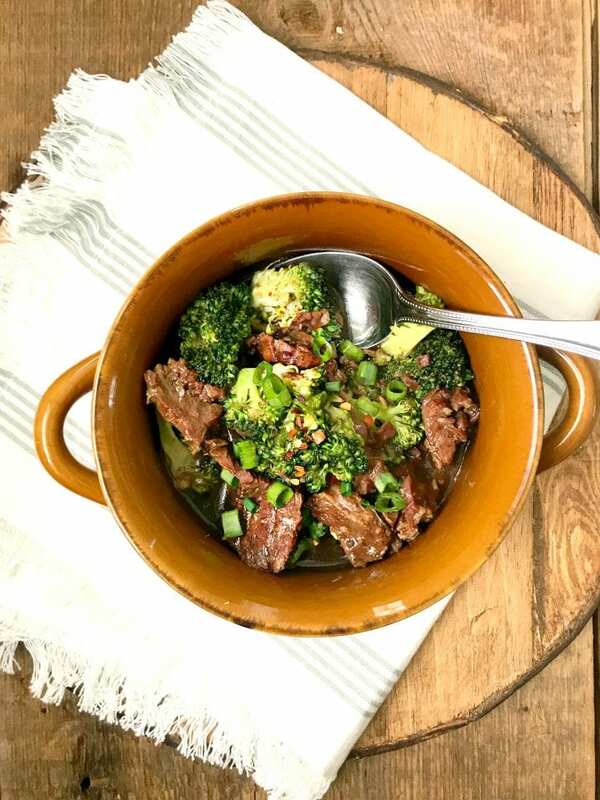 This delicious Instant Pot Beef and Broccoli is a healthier spin on the take-out favorite! It’s gluten-free, dairy-free, 21 Day Fix approved, and oh-so-easy-to make in the Instant Pot! This post contains affiliate links to products I’m obsessed with. While I have high hopes for 2018, so far it’s been, well…cold. And I’ve also been sick, so my plans to get back on track workout wise might be derailed at the moment. 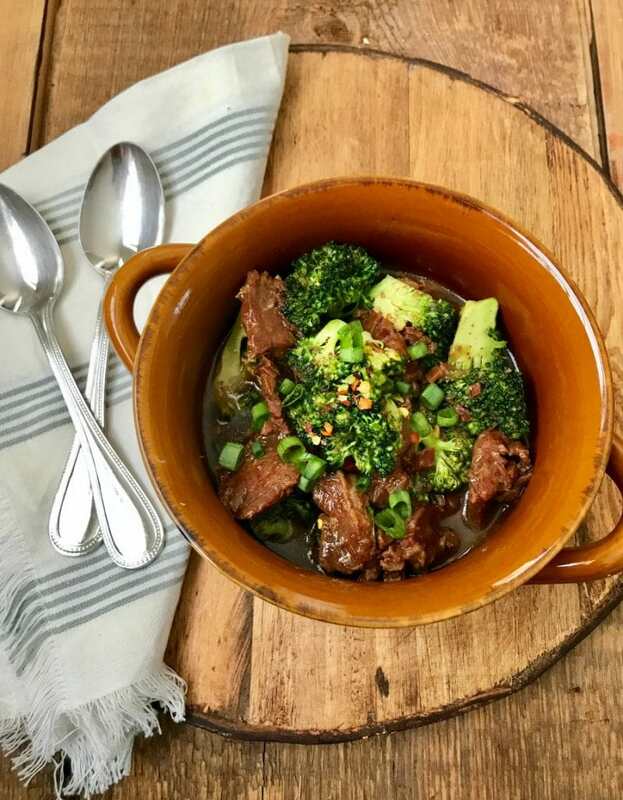 And I probably shouldn’t be typing up a blog post right now with this crazy headache…please forgive whatever typos you might see…but I shared a pic of this new Beef and Broccoli recipe in our 21 Day Fix Instant Pot Community and let’s just say there was a lot of excitement. Since I don’t like to keep you all waiting…and since sleep is impossible with this annoying cough, I am attempting to get this out to you tonight. 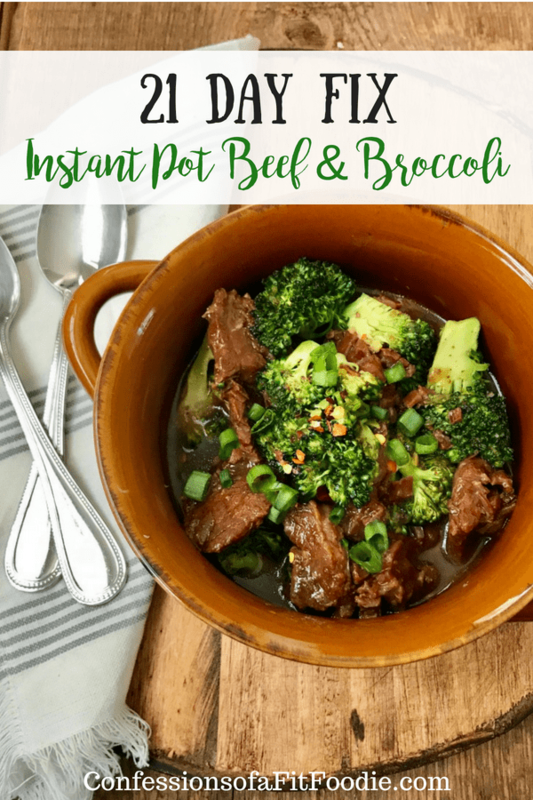 And really, as far as Instant Pot recipes go, this one is SO easy! I sautéed up some shallots and garlic, then added some thinly sliced flank steak with a delicious and quick sauce using coconut aminos, broth, and some honey. Lots of people ask about Coconut Aminos – this is the brand I use and get at my local market. It’s a much healthier sub for soy sauce, but if you can’t find it, you can pick up some low sodium soy sauce! 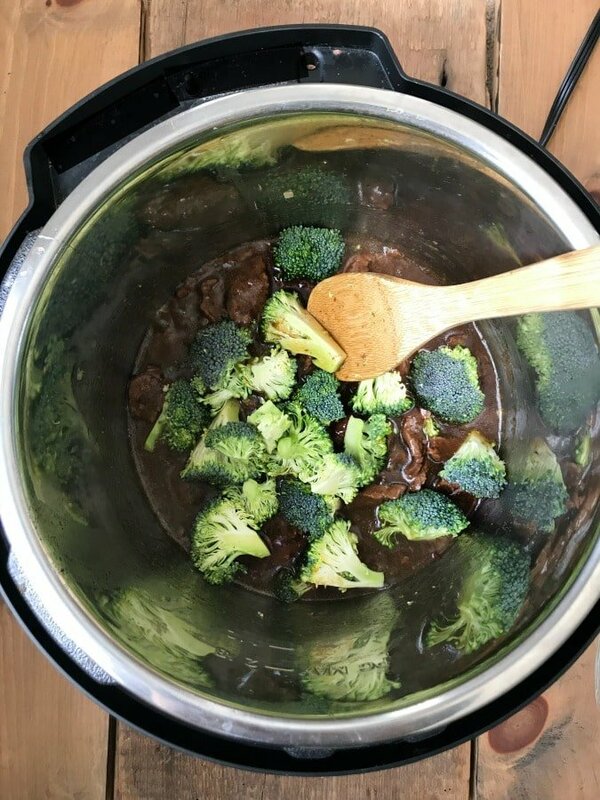 The meat gets cooked alone in the Instant Pot because broccoli turns to mush pretty quickly under pressure. After a partial natural release, I quick released (same technique as my Flank Steak Tacos) and then I thickened the sauce with a slurry, which is just a fancy name for mixing a flour type thickener (I use arrowroot) with some of the cooking broth. After that, the broccoli goes in raw and you just pop the lid back on and go set the table or help your kids finish homework…or just mindlessly scroll facebook for a few. Whatever you feel like doing. And 5-10 minutes later you have perfectly cooked broccoli! Yay! Now of course you can feel free to microwave yourself some frozen broccoli instead – whatever is easiest for you! I thought I would take more pictures of this over rice…it’s SO delicious that way…but again…sick and this week just got away from me. 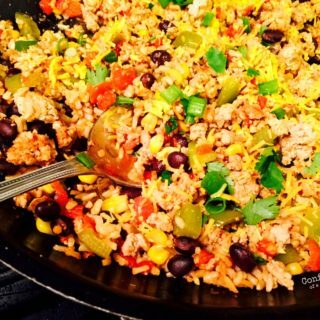 You could also serve it with quinoa or cauliflower rice! Yum! As always, if you make this, let me know what you think! I LOVE hearing from you! 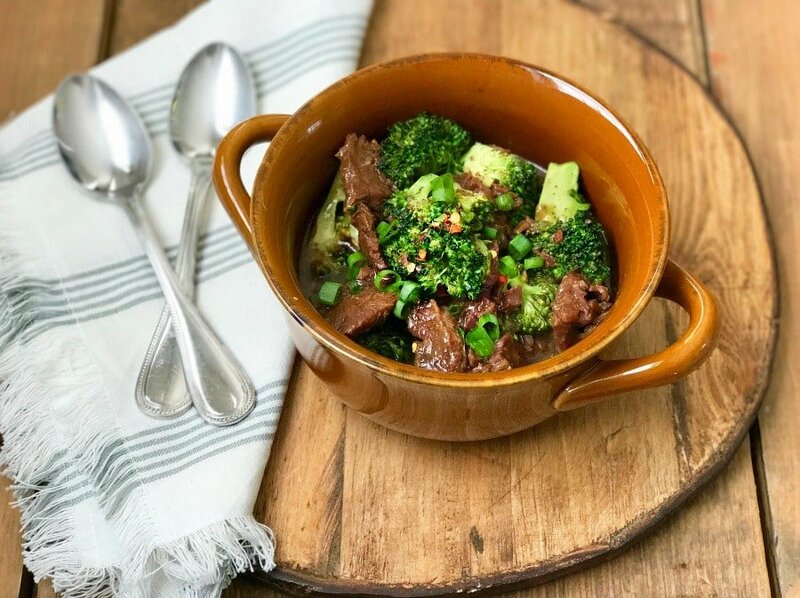 This delicious Instant Pot Beef and Broccoli is a healthier spin on the take-out favorite! It’s gluten-free, dairy-free, 21 Day Fix approved, and oh-so-easy-to make in the Instant Pot! Set Instant Pot to Saute. When it’s hot, add olive oil and shallots and sauté until they begin to soften and become fragrant. Add in garlic and cook an additional minute. Pour stock mixture into the IP and add in sliced flank steak. Cover and lock your Instant Pot and set to manual/pressure cook for 12 minutes. When cook time is up, allow to naturally release for 5 minutes before finishing with a quick release. Carefully take off the lid and remove 1 cup of the cooking liquid and make a slurry by whisking in 1/2 T of arrowroot starch. Mix until well combined and then return to pot. Set IP to sauté and stir until the sauce begins to thicken. Repeat slurry process if necessary (it wasn’t for me) . Stir in salt. Turn pot to keep warm. Add in chopped broccoli florets and stir everything together. Place lid on IP and give the broccoli 5-10 minutes to steam from the heat of the pot. When broccoli is to desired tenderness, garnish with some scallions, crushed red pepper, and additional grated ginger if desired (I did all three). 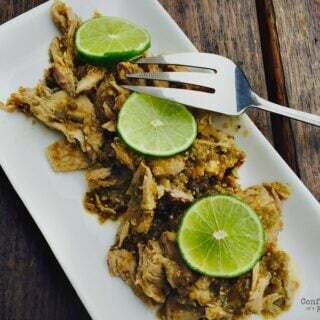 I’ve probably made every one of your recipes (a hundred times over) and I must say, this is my favorite!!!! It was so good! My husband said the meat “melts in your mouth,” and my 4 year old kept asking for more. It tastes so rich and delicious, you’d never know it’s healthy! You have NO idea how happy this makes me!! Thank you, Alyson!! O.M.G.!!!! 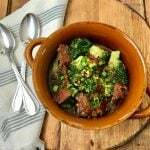 I’ve been looking and looking and looking for a recipe for beef/chicken and broccoli for a very long time that tasted like a restaurant – and this hit the mark and surpassed it because it’s healthy and delicious!!! Thank you for making a recipe that makes it feel like we had a treat but with none of the guilt! This will become a staple dinner in our house! This was so good! I think my favorite IP recipe so far… wasn’t even looking for healthy, that’s just a plus. I loved adding the fresh ginger at the end in my bowl! So good, thanks! YES!! This makes me so happy! And, right? The fresh ginger really makes it! Thanks for the great feedback! Chicken, just switched the protein and the broth :0) I’m waiting for my Instant Pot to come, so I also made this using a wok and it was wonderful! Oh great! This will help other readers – thank you! I just got home to cook this and my broccoli is yucky. Can I sub frozen? How do I adjust cooking times? This was very good, but for me was missing something. I am going to add some rice vinegar and sub the honey with oyster sauce in the liquid ingredients next time to get that restaurant taste I’m looking for. Love this! Although i do not have a pressure cooker… can this be made in crockpot? If so, how should i change it up? I would do 6-8 hours on low for the crock pot. Made this tonight and all I have to say is Mmmm. It was a huge hit in our house. Thank you for making this our second 21 day fix meal! 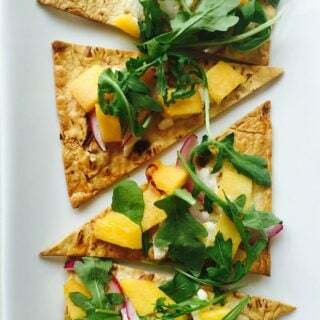 Cheers to healthy eating! Yay!! Makes my day to hear this!! Do you have stove top instructions? Thanks! I am going to try this for the first time. My question is if I need this for a family of 6-8 how do I alter the amount? Please help! I’m a new IP user. Hi Dawn! I would definitely double everything, but keep the cook time the same! 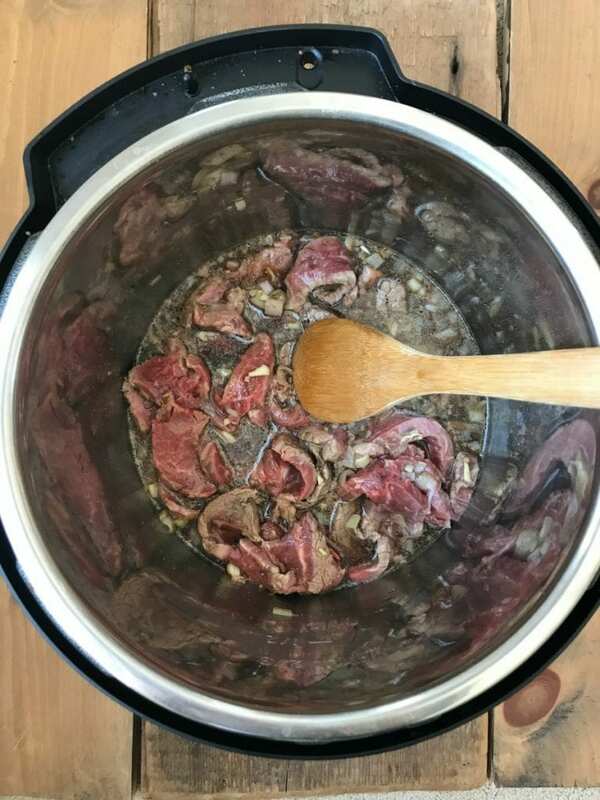 If I’m using 3 lbs of boneless stew meat instead of flank steak, what would my cooking time be? Thanks! Should still be the same! I’m doing the Shred 10 and I just made this for dinner tonight. It’s SO HELPFUL to find recipes like this that are delicious and don’t make me feel like I’m depriving myself. Thank you so much for sharing!! That’s awesome! What is Shred 10? This might be a silly question, but if you make this without the arrowroot or thickener/flour/cornstarch would it make a huge difference in the taste or texture? I don’t have anything but flour at home and I’m trying to follow the 80 Day Obsession meal plan as closely as possible. Thanks! Hi! It will still be yummy, but it won’t be as thick as I would like it to be. Maybe simmer the sauce a little after cook time with the lid off to thicken it more. Hi! I’m confused about the serving size. 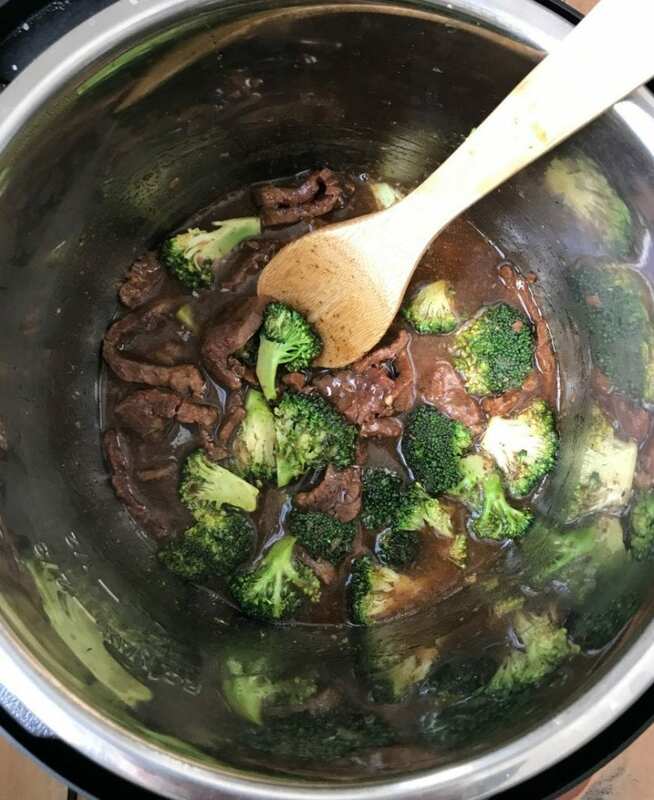 Measure out 3/4 of meat, 3/4 broccoli, OR one full serving of everything together is 3/4 cup? Since it all cooks down, one serving is 3/4 cup. You can bulk it up with more veggies!!!! This is one of my favorite Fix recipes and love that I can make it in my IP! Thank you for all the awesome recipes, especially this one! I’m so happy you liked it, Katie! Making this for the second time tonight… first time was a huge hit with the whole fam! I added sliced carrots at the same time as the meat, and also marinated the meat in the aminos mixture while I did the other steps. I also threw some Chinese 5-spice in as I was feeling sassy ? I am already drooling – thanks for another great recipe!! Seriously amazing!!!! It tasted like I was cheating! As do all your recipes? I seriously need to start doubling them all so I can have more leftovers I am so sad when the pot gets emptied lol but happy too that everyone loved it! I’m so happy to hear this, Anna!! Made my day <3. Instead of fresh grated ginger, can I use ground ginger? If so, how much?? Sure! I would start with a half tsp! I’m tracking my food using my fitnesspal. Do you happen to know what is the protein, fat, and carb amounts? Hey – I think you can put the recipe right into my fitness pal and get the macros! I do not have an instant pot so I am wondering if this can be made in the crockpot and what would the instructions be? Yes! Add all the ingredients except broccoli into your crock pot and cook for 6-8 hours on low, adding in your broccoli for the last 30 minutes! After cook time, you can thicken the sauce in pot on your stovetop! I promise I am working on one!! Do you have a crock pot? Is there a way to make in the slow cooker? This looks amazing! Yes! You can cook it on low for 6-8 hours, adding the broccoli in for the last half hour. You can thicken the sauce on the stove top! Learning alllll about my new Instant Pot with your recipes, (and thank you for encouraging me to get one, has been one of my best purchases of the year!) Just made this with chicken, over top of ramen noodles…insanely good. Thank you, NL! This makes me SO HAPPY, Kara!!! You have no idea!! I miss your face – let’s please plan something soon!! Excited to make this tonight! Do you think it would work with stew meat? How do coconut aminos fit into the 80DO? What do they count as if I want to add them to another dish? They are free as long as you use small amounts! Where can I find the 21 Day Fix Instant Pot Community that you mentioned? Is there a website? 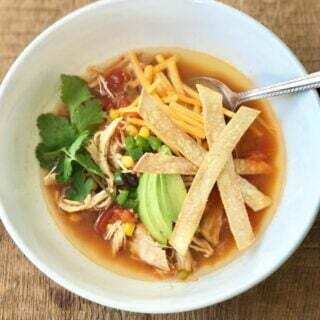 I love cooking 21 day fix recipes and I just got an instant pot so I would love more recipes!! If you think you have more, I would just divide the pot into 4 equal portions before serving!